Price request for RM 50-01 Capteur de G Lotus F1 Team Romain GrosjeanRef. 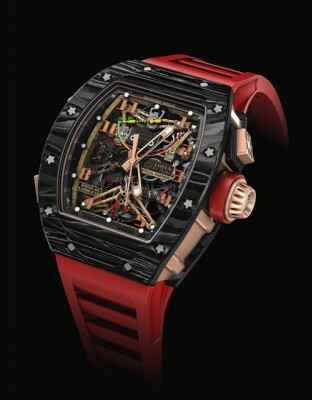 Richard Mille Watches is the ofﬁcial partner the Lotus F1 Team since 2013, and this fruitful collaboration on F1 tracks around the globe has given birth to the ﬁrst tourbillon watch dedicated to the team and especially one of the Lotus F1 Team drivers, Romain Grosjean for whom Richard Mille created this new tourbillon driven timepiece. Although racing under the French ﬂag in F1, Romain was born in Geneva and holds dual French-Swiss nationality. He was the 2007 F3 Euroseries drivers’ champion, the inaugural GP2 Asia Series champion, the 2011 GP2 Asia Series and GP2 Series champion and is the ﬁrst and only – as of July 2013 – two-time GP2 champion holding both the GP2 Asia series and main GP2 series titles simultaneously. In 2012, Romain Grosjean returned to F1 with the Lotus F1 Team. 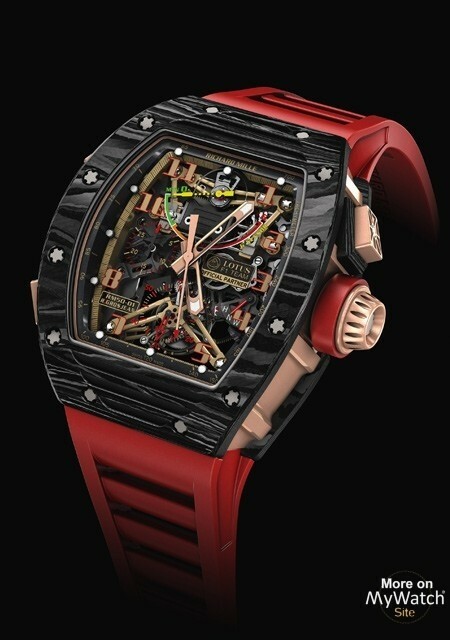 This exceptionally sporting timepiece is in perfect harmony with the world of F1 racing, starting with its mechanical heart, a manual winding tourbillon chronograph caliber with mechanical G-force sensor. The new movement design is founded on a concept of long-term reliability achieved through studies on the proﬁle of the barrel and pinion teeth proﬁles. These new proﬁles optimize the maximum transmission and regularity of power through the movement’s going train in a similar manner to those proﬁles found in optimal engine transmission gearing. The architectural layout of the modern movement design details a coherent and rational chronograph mechanism that avoids any unnecessary waste of energy and motion, through the application of technical solutions to optimize its operation. This is accomplished through the extensive use of materials such as titanium and the perfected synchronization of different interacting parts. 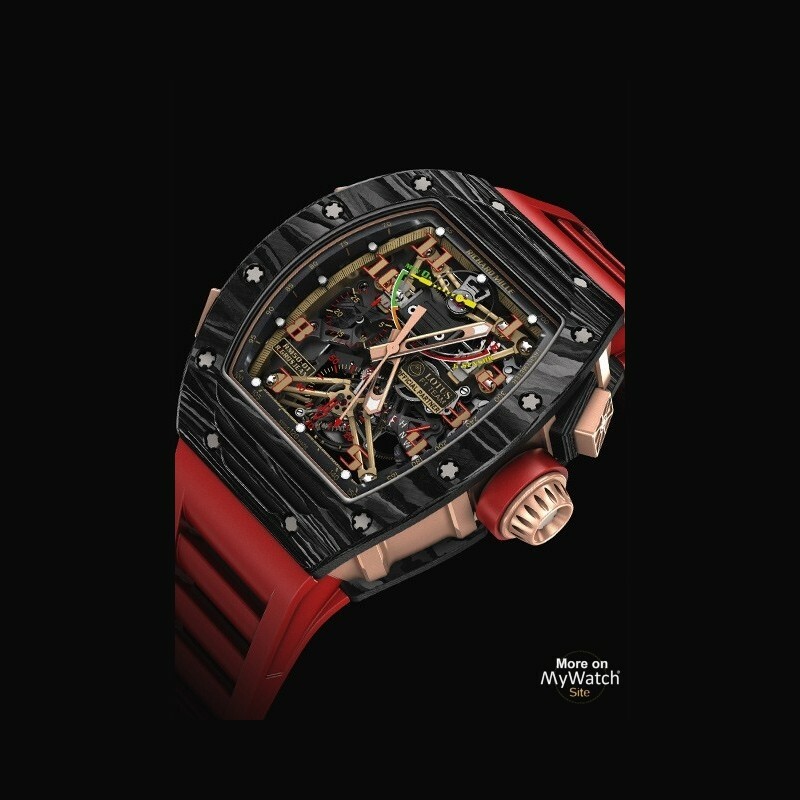 Parallel to the best racing machines, the movement is assembled on a rigid baseplate of grade 5 titanium, offering exceptional stability and improving the functioning of the movement. In motorsport, the driver must obtain maximum information about his car and his performance. 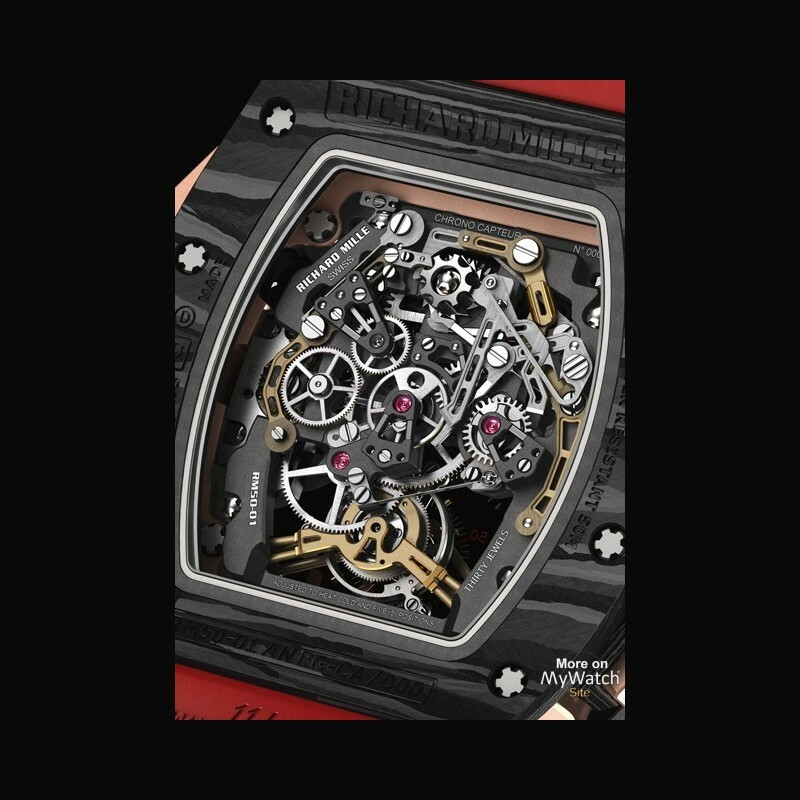 Based on this observation, the RM 50-01 uses a function indicator which shows whether the movement is in Winding, Neutral or Handsetting mode, with the addition of a mechanical G-force sensor, a mechanism able to transcribe the range of G’s endured by the driver during deceleration phases. In total this requires more than 500 components for the creation of this ultimate racing tool. 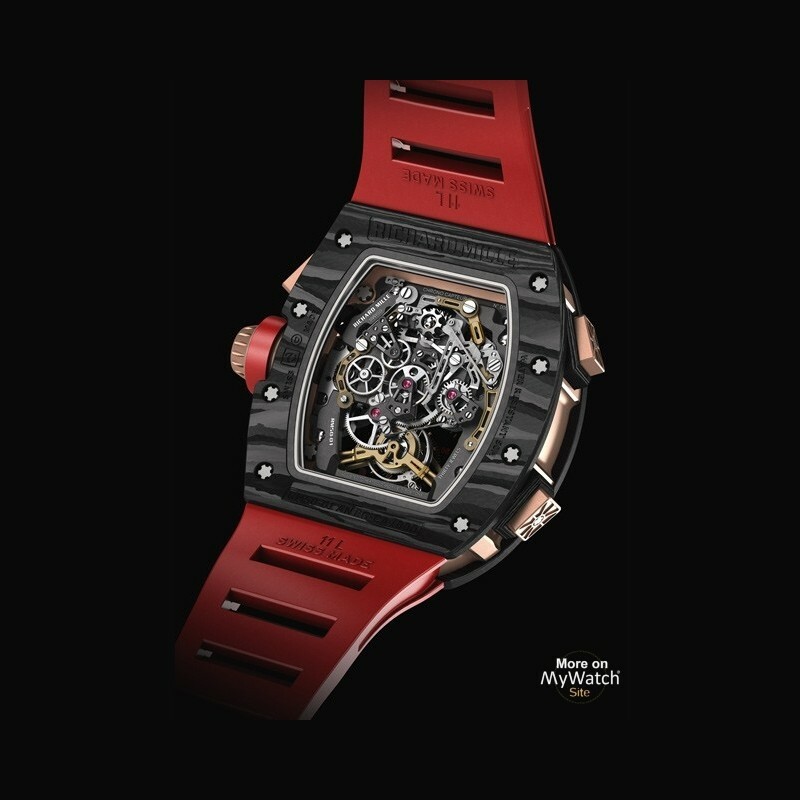 The RM 50-01 has a case created from carbon NTPT® with a choice of caseband in 5N red gold or carbon NTPT®. 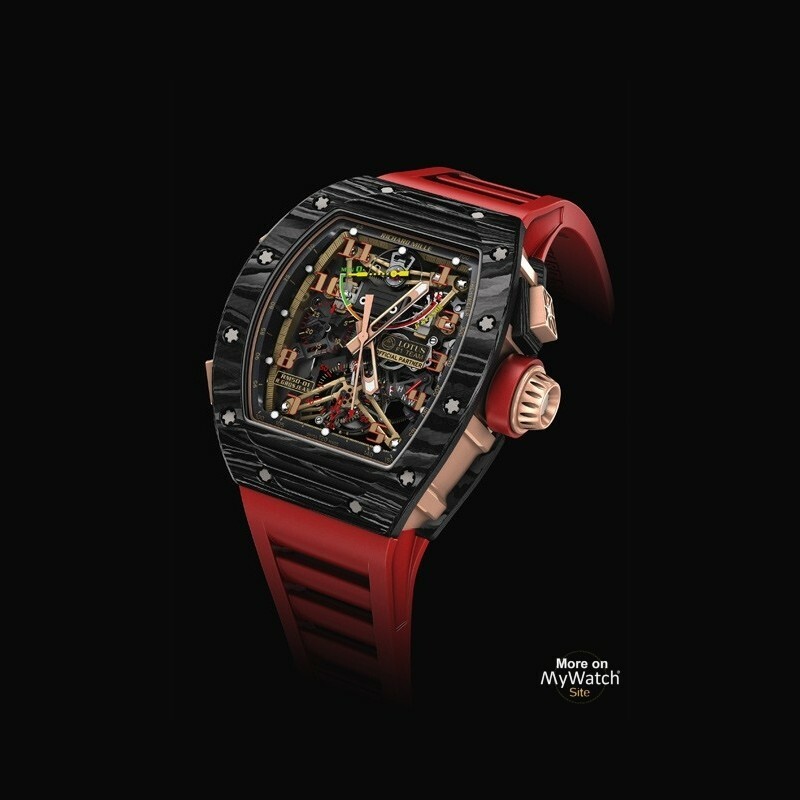 This new carbon material, a Richard Mille exclusivity, consists of more than 600 layers, each 30 microns thick of woven carbon ﬁlaments that are compressed and heated to achieve an unbelievable level of strength and rigidity. These exceptional timepieces will be produced in a limited edition of 30 watches, each accompanied by hand assembled 1/5th scale model of the 2014 Lotus F1 racing car.